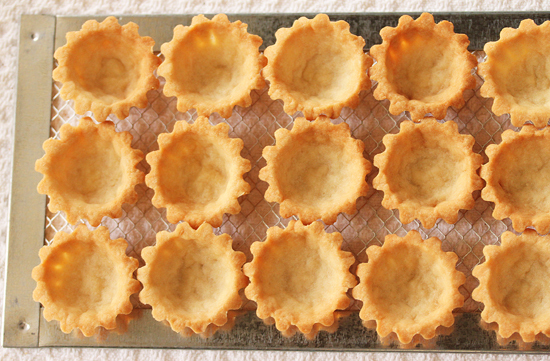 Yesterday my plan was to make these Mini Tartlet Shells and photograph them. Next I was going to make the Lemon Curd and fill the tart shells. A couple of weeks ago I made the Little Buttercream Bees that were going to embellish their tops. Then I was going to photograph the finished tarts and write my blog about the whole thing. Well, guess what, that isn’t what happened. Here you can see the 2-inch mini brioche tins and the ball of dough. 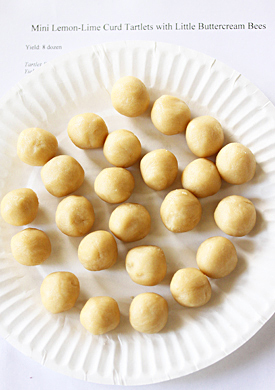 You fill a ½-tablespoon measure with dough, which is then rolled into a ball and placed in a tin. 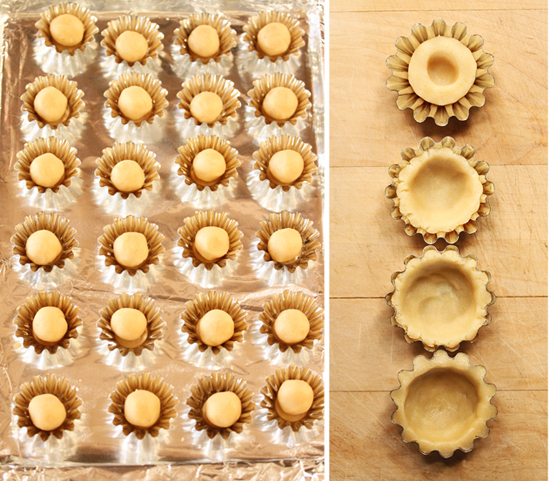 I made the tart shells and photographed the process. Then just to make sure they were ok, I looked at them on my computer monitor. I take a lot of photos, hand held, so I have no idea what the photos are like until I see them on my screen. I mean, how interesting are tart shells, really. On a scale of 1 to 10, they’re a 1 at best. But this bunch of photos of the tart shell process were really interesting to me. Usually I photograph one food item at a time. If they’re small and alike, maybe three items. But here I had 24 small metallic brioche tins. That were also shiny. When they were lined up on the baking sheet, all of a sudden there were these visual patterns that were mesmerizing. And I had to show you… forget about the lemon curd. Here you can see how to press the dough into the brioche tin. Poke a hole in the middle with your finger and start spreading it up the sides. Make sure when you’re done that it is flat on top. This photo was a complete surprise to me. When I looked at it for the first time, I said to myself, “Whoa, that’s gorgeous.” I don’t mean to be blowing my own horn here, because I have no plan when I shoot and the way the photos turn out is a complete surprise to me. I think I’m going to print this out, frame it and hang it in my kitchen. While your first batch of shells is baking, you can measure out and roll up the dough for the next batch. This photo has been endlessly fascinating to me and is the optical illusion I discovered hiding in my photos. The first time I looked at it, all of the wells were in-ies. The next time I looked at it, the upper left corner well was an in-ie and all the rest of the wells were out-ies. Now when I look at it, I can get one well to be an in-ie if I really concentrate on it, but when I blink it is an out-ie. I cannot get two side by side wells to be in-ies no matter how hard I concentrate. Our brain is such a mysterious thing. How do you perceive the wells? And if you are weird like me and want to read more about patterns, particularly Fibonacci numbers, you can go here at World Mysteries. I thought this was very thought provoking. 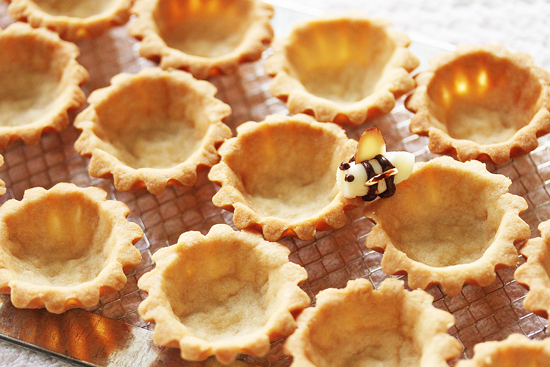 Ok, so back to the Mini Tartlet Shells. 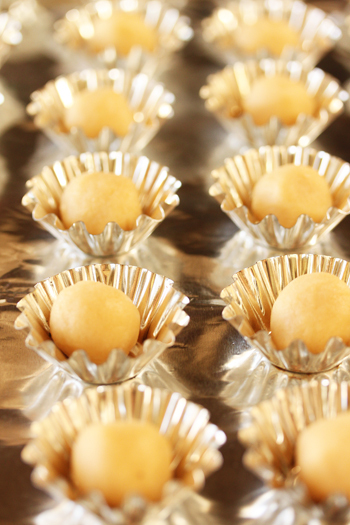 Here they are in all their golden glory and the recipe is below. Next I will make the lemon curd, fill them and some little bees will be landing on top. 1. Preheat oven to 350 degrees F. Place oven rack on lower 1/3 of oven. 2. In a processor, combine flour, salt and sugar. Add cold butter slices and process to consistency of cornmeal. 3. In a small bowl, whisk together the egg and vanilla. Add egg to flour and process until it forms a ball. Remove dough ball from processor and press together with heels of your hand until smooth and cohesive. 4. 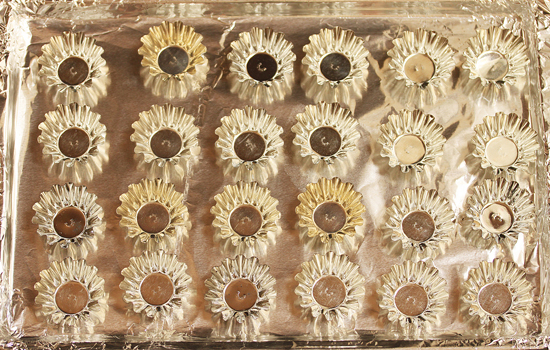 Arrange 24 ungreased 2-inch tartlet tins on a baking sheet. 5. 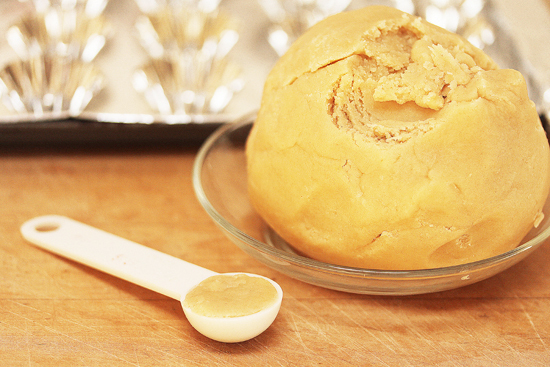 Pinch off a small piece of dough and press it into a ½ tablespoon measure, returning excess to the ball of dough. 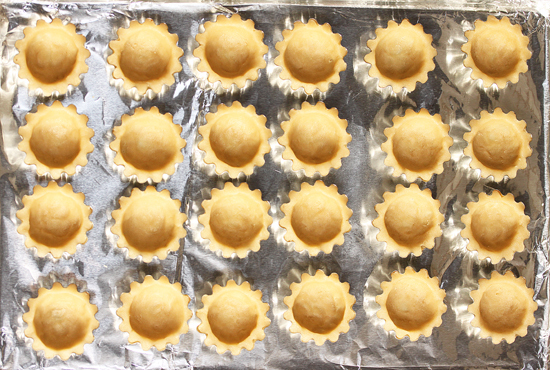 Roll the ½ tablespoon of dough into a ball and and press into tartlet tin. Repeat until all tins are filled. 6. With oven at 350 F, bake tartlets 12-15 minutes until golden brown. Remove and cool. When cool enough to handle, remove from tins. 7. Store in air tight container at room temperature up to one week. Note: Well wrapped dough can be refrigerated for one week; freeze for one month. Your photographs were mesmerizing! I love repetitive patterns too, and I just wanted to print out each and every shot you took! I loved seeing how you made these little beauties too…they take work, but they are worth it in the end! And you know I love your bees…they still tickle me pink. Thanks for sharing! i *love* your photos in this post! Each photo is fascinating…but that one with the in-ies and outies…haha amazing! i was confused at first but then it suddenly hit me what you were talking about! I was hypnotized by the photos on this post forquite a while. I kept tracing imaginary diagonals and focusing on one of the objects and then shifting to another and then just enjoying the overall effect and the shinyness. When I finally distracted myself from the visual effect I started wondering about extracting all the golden shells from the mold…was that a nightmare? I made lemon curd on the week end too, for a lemon tart I will be posting about soon and loved it (although the cake turned out not that pretty). So I really look forward to reading your recipe and comparing, now that I am addicted to the citrusy flavor. Um you’re so right, these are totally mesmerizing. I love the optical illusion you’ve created! I would love to have that picture on my wall! Lynne – I’ve been wanting to make my own little tartlette shells and wasn’t sure which little pans to buy. This couldn’t have been a more timely post for me. Thanks for sharing this and your beautiful photography with all the little tins and patterns…this is magazine/book-worthy material! I’m heading over to start shopping for mini-tart tins. That IS a really cool photo! I had to stare at it for a while as well. These little shells will be very useful this holiday season! You could frame all of these and hang them in your kitchen! But then you could say that about most of your shots. Oh, and I see those as outties (but they run with the in crowd). Beautiful pictures! Even if you did toot your own horn, it’s just telling it like it is! ^_~ Gorgeous and absolutely awesome!!! Thank you for sharing how to make tarts steps by steps, It made it lot easier for me follow the recipe. I love the optical illusion pics too! Puzzle, art and food all one! So cute – where did you buy the tart/brioche tins? I’ve been looking around but haven’t found ones that deep. You are absolutely right – these are gorgeous! Thanks for making this a separate post. Now, I’m more inclined to make them – the shells are lovely. And that 3rd-last photo really is an optical illusion, just fascinating. You’re making me wish I owned these little brioche tins, they’re completely adorable. Stunning… absolutely stunning!!!! I must be kinda weird too because I love reading about numbers and patterns too!!! 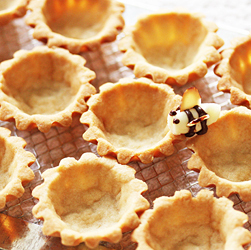 Great tutorial on how to make tart shells. They take some time, but are oh so worth it!! Gorgeous! I completely know what you mean when you sometimes have no idea what to expect from a photograph and are pleasantly surprised. Love the tutorial! I really need to make more pastries. OH yes! Please share where you purchased your tins! Please! Hi Annie ~ I bought those brioche tins about 20 years ago at a cooking store near me called Cookin Stuff. I went there today and looked to see if they still had them. They had some that were slightly larger, but not exactly identical. Actually, you can use any little tart, tartine, barc or brioche tin. They will all work. These are so cool! I found your shells via Foodgawker and have started going through the many posts about tartlets. Thanks for posting this! You make it seem so easy. I’ve read the recipe through a couple times and couldn’t find how long to cook the shells. Can you give an estimate as to how long “until golden brown” is? Thanks. Thank you so much for this recipe! The tart shells have fabulous flavor and hold up extremely well, yet they are still flakey when you bite into them. Incredibly time consuming, but awesome end result. I might have slightly bigger tart tins, because I found it took a little more like a rounded half tablespoon, which slightly increased baking time. Fabulous. Thanks again! I’m so happy that I’ve gotten across your page. This looks amazing! I am now officially a fan. I’m planning to make these for Christmas and was wondering if I should grease the tin shells with butter/oil/shortening before placing in the dough? I’m from the Philippines and those cooking sprays are not readily available. Thanks! I LOVED THESE!!!! The optical illusion is just wonderful and yes our mind definitely flirts with patterns! I made strawberry hart tarts and they turned out delightful. Since I wanted them to be able to fit the filling in I thinned out the sides and this resulted negatively in trying to get them out But Thank goodness I did a test batch because the 2nd time around they turned out just flawless. Oh and the taste was just like a strawberry shortcake. I have my pictures on http://foodsetsthemood.tumblr.com/ so check it out and TRY THIS RECIPE!!! Simply beautiful. I must say these are absolutely amazing…. I’m eager to try them out. What could I substitute for the egg? I know this is an old post but I just came across it..thank you for sharing this recipe for the tartlette shells and for your beautiful photographs. This was the third batch of tartlette shells I made in my mini muffin pan and the only one that worked! wow….they look so pretty. I am planning to make some pumpkin tarts. Will try your recipe. The Scandinavians would call these tart shells Sandbakkelse or Sand Tarts. The (cookies) are usually served empty and upside down to show off the patterned exterior, sometimes with bowls of filling on the side. The recipe is a variation of it (in my recipe, I substitute 1/2 cup of the flour in yours for 1/2 cup of ground almonds and use a mix of almond and vanilla extract). The tart tins can be purchased online under the name Sandbakkelse Tins, though they may have a mix of shapes and sizes. Of course, since you’re in Minnesota, you must know all this! OMgoodness! I totally perceived them as being outies and thought….. How in the world am I going to fill those….???!!! Then I read your post about the optical illusion and BAM! I blinked and they became innies! Lynne thank you so much for your response…. I am going to fill them up with tuna mix with mayo and some chicken salad with ttarragon. Okay so the 1/2 teaspoon will not work?? Hi maria ~ I cannot recommend these tart shells for your tuna and chicken filling. I believe they may be too wet and might make the bottom of the shells soggy. Instead I recommend simple crostini or croustades. Crostini: Slice a baguette into 1/4-inch slices and brush both sides with melted butter. Broil on baking sheet for 1 minute per side, or until slices are golden. Croustades: Cut white sandwich bread, crusts removed, into four pieces per slice, about 2 1/2 inch squares. 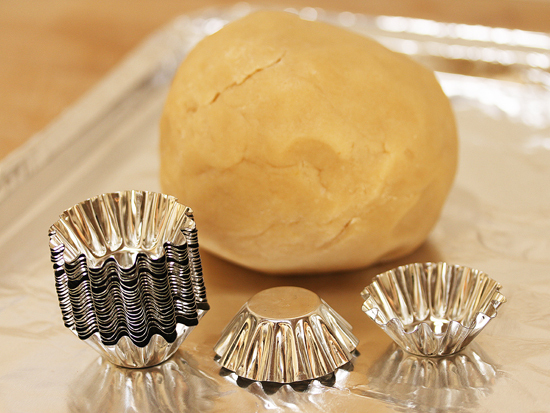 Brush with melted butter and press into openings of mini muffing tin. Bake at 375 degrees F for 5 to 8 minutes until edges are golden. Did you spray/coat them well before dding the dough? Did you remove them prior to serving? If so, how difficult were they to remove from the tins? Did you fill them prior to or after adding the filling? I have some and plan to make no bake ones with a graham cracker crust. Hi, Lynne! These look perfect. I love patterns too, and your pictures are gorgeous. I was wondering how these shells hold up over time. Do they stay crispy after a day or two or do they get soft and/or crumbly? I was thinking to fill them with mousseline cream and then top with fresh strawberries and a jam glaze. Thank you!